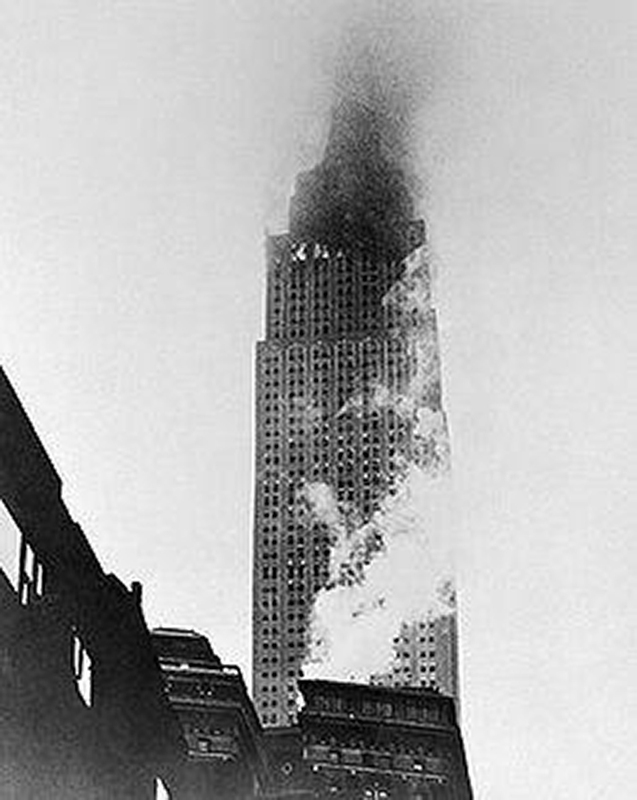 On July 28, 1945, an airplane crashed into the Empire State Building. A B-25 bomber was flying a routine mission, chartering servicemen from Massachusetts to New York City. Capt. William F. Smith, who had led some of the most dangerous missions in World War II in the European theatre, was the pilot. The day was foggy. Smith called LaGuardia Airport and requested a clearance to land. With nearly zero visibility, the tower suggested that Smith stay in the air. He ignored air traffic control and started a descent that took him over midtown Manhattan. Just as he straightened out, the clouds broke up enough for him to realize he was flying among skyscrapers. The bomber crashed into the Empire State Building, the tallest building in the world at the time. 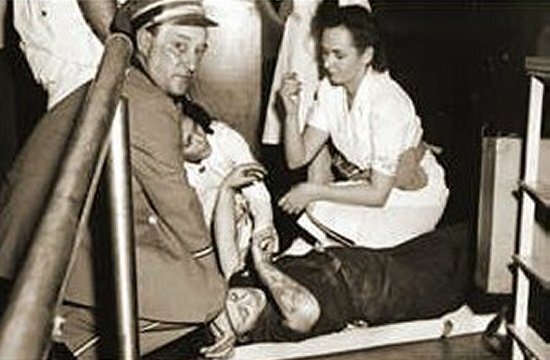 The collision killed Smith, two others on the plane, and eleven people who worked inside the building. 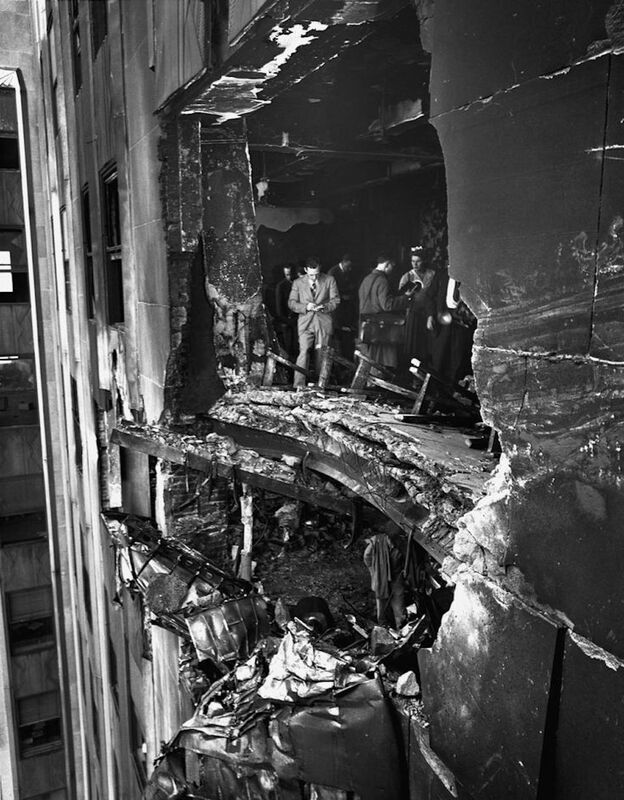 When the plane hit, parts of the engine flew ahead and severed the lifting cables of two elevators on the 79th floor. The elevators crashed to the sub-basement. In one of the elevators was a 19-year-old elevator operator named Betty Lou Oliver. She broke her pelvis, back and neck — but she survived. It was a fluke of physics that saved Oliver’s life. As the elevator plummeted from the 79th floor, the elevator cables coiled underneath the cab that created a kind of spring that cushioned the fall. The crash prompted new legislation that—for the first time—gave citizens the right to sue the federal government. This story was produced by Joe Richman and Samara Freemark for Radio Diaries. The Radio Diaries podcast is produced by Sarah Kramer. Since 1996, Radio Diaries has been producing documentaries for NPR’s All Things Considered, often turning the recording gear over to the people they’re documenting in order for them to tell their own stories. In 2013, Radio Diaries unveiled Teenage Diaries Revisited, a massive project following up on five teenagers Joe had documented in the late 1990s. It’s kind of like a radio equivalent to the Up series. It’s amazing. Radio Diaries is also behind some of the most incredible documentaries ever to air on radio anywhere, including Thembi’s AIDS Diary, Teen Contender, and Willie McGee And The Traveling Electric Chair (all of which won awards at the Third Coast Festival). Sold yet? Subscribe to their podcast! Interstitial music is by Keegan Dewitt this week. Get to know him! Our Squarespace featured site is from Jaime Alvarez. Pretty rocks!